I have a confession to make; I didn’t read Pride and Prejudice until AFTER I read Death Comes to Pemberley. I know this is a bit backwards and I’m a little embarrassed to say that Jane Austin was never one of my first choices when choosing a book. I read a lot and I like to read a wide variety but for some reason I was never overly drawn into this genre. I enjoyed Death Comes to Pemberley but I hated that I wasn’t entirely sure who everyone was. It annoyed me a bit that an author would piggy back on a classic work so thoroughly that the characters were a bit confusing if you weren’t very familiar with the original work. However, the story was compelling and it was a quick and easy read, something I am often in need of. 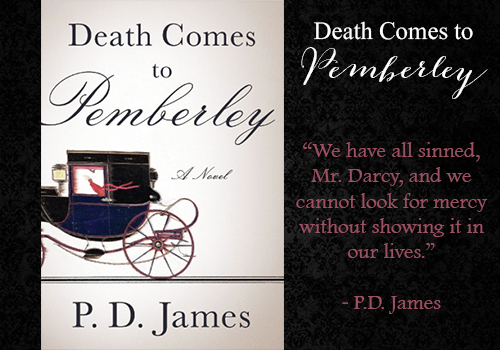 Avid Jane Austin Fans are often critical of Death Comes to Pemberley, and even though I had some complaints I believe some books were meant to be read with nothing but entertainment in mind. This entry was posted in Images and Words and tagged Book Reviews, Fiction.